The Common Buzzard lives in forests throughout Europe, preferring woodlands located near an open expanse. Preying upon small mammals and occasionally other slower birds, like moorhen, the Buzzard is often described as “lazy” since it is slower in flight than other raptors. In flight, the European Buzzards prefer to simply soar, using few wing movements, on thermals below 800 feet off the ground. It is territorial and will chase off any birds intruding on its aerial territory. The Buzzard hunts by simply waiting on a tree branch; when a tasty-looking animal passes below, the Buzzard swoops onto it. Generally, this animal will be a rabbit, as these consist of the majority of the Buzzards’ prey, but voles, weasels, squirrels, shrews and rats are common meals. Occasionally, the European Buzzard will awkwardly walk through fields in search of insects. Buzzards eat very little, averaging five ounces of food a day! Buzzards also frequently eat roadkill. When it perceives a threat to its kill or find, the Buzzard will protect the body by spreading its wings above its back in the “angel” posture. If the Buzzard feels it cannot win a fight for the body, it will gesture submission by “playing dead” on its side with one wing in the air. Buzzards communicate with a “mewing” noise, especially during the breeding season. 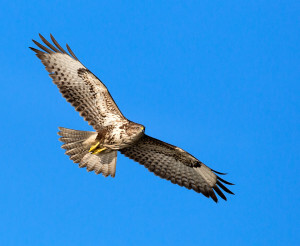 Most often Buzzards “mew” while soaring, and lots of chattering and low chortling noises occur around nest sites. 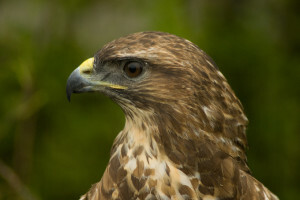 People unfamiliar with the European Buzzard often mistake it for the Golden Eagle, and this resulted in the nickname “Tourist’s Eagle” for the bird. This Tourist’s Eagle is a very good bird for beginning falconers because of its size and temperament. Despite their description as “lazy”, the beautiful Buzzard is intelligent and ready to please and with proper training, will provide ample rewards. They are in fact quite acrobatic, displaying amazing aerial abilities during the breeding season. As would be expected, temperaments vary from bird to bird, though usually males have better characters than females. The average Buzzard measures 17 to 22 inches, with females usually a little larger than males. Coloration varies greatly, from dark to almost white, and usually provides good camouflage for this tree-dweller. The Buzzard’s wings span anywhere from 48 to 60 inches and resemble moth wings. 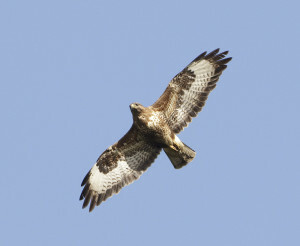 The European Buzzard ranges throughout Continental forests and open farmlands and moorlands. It inhabits most of the European countries to Asia. In the 1950’s, when Britons introduced Myxomatosis to rid themselves of rabbit overpopulation, the Buzzard suffered when its main food source was wiped out and nearly became extinct on that island. Since then, it has also suffered from pesticide poisoning in the bodies of carrion throughout Europe. 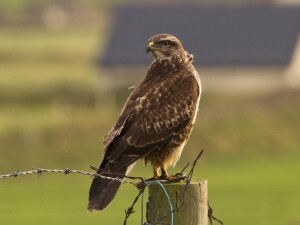 Farmers and ranchers shoot Buzzards and poison them, assuming that the birds will carry off young livestock, especially lambs, when in fact the European Buzzard will only eat these animals once they are already dead. In many countries, it is illegal to harm these lovely birds, and they are valued by falconers worldwide. 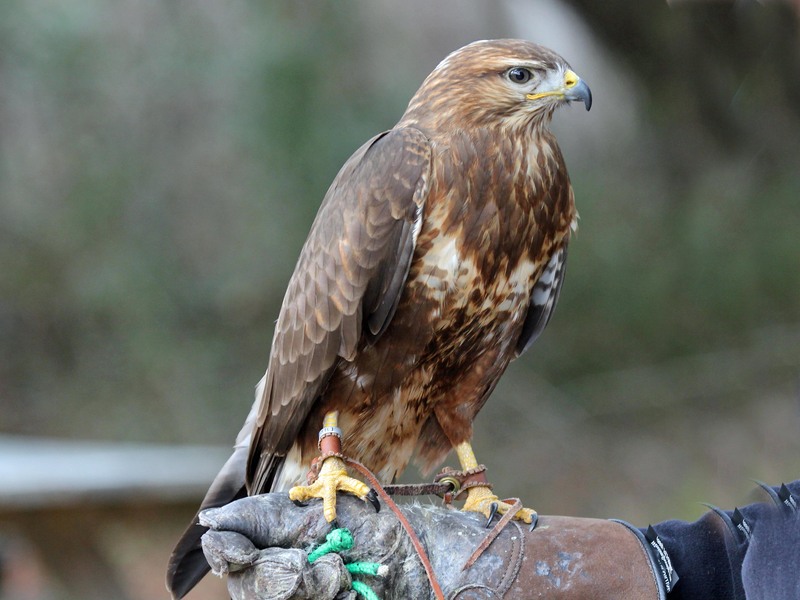 The Common Buzzard is a good beginning falconers’ bird, and usually falconers who can handle a Buzzard will be very well prepared for a larger raptor. However, your teacher or classes are the best advisors in choosing a bird. Usually male Buzzards have better temperaments than females, who can sometimes be considered unaccommodating, after a certain amount of time. 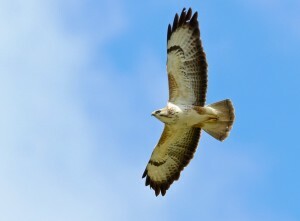 The European Buzzard is believed to mate for life. It builds nests on rocky ledges or trees, usually made of small sticks and twigs with the leaves still attached. During mating season the Buzzards call to each other and show off in the air, swooping and diving horizontally and vertically and before shooting nearly directly vertically back up into the air. They wing-touch and “dance” and tumble through the air, swooping down upon each other with talons open but not making contact. Mating occurs only once a year, and three to four eggs are laid between April and May. The pair of Buzzards take turns in sitting on the eggs, which hatch after about 34 days. The pair also takes turns in feeding the young until they are about 45 days old.